Tag along as these intrepid explorers discover a wild new frontier with this adventurous terrarium by miniature world virtuosos Michelle Inciarrano and Katy Maslow. This clever, moss-filled microcosm is populated by two Lilliputian pioneers who hike though the verdant sculpture's hilly mosses and fossilized wood mountains that rest atop a foundation of rich soil and multi-colored stones. 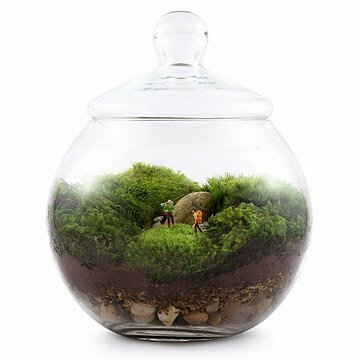 The whimsical "Uncharted Territory" terrarium comes fully assembled in a glass apothecary jar and brings the thrill of adventure and the tranquility of the great outdoors to your home or office. Handmade in Brooklyn, New York. Jar made in China. Take a studio tour to see where Michelle and Katy bring their miniature nature scenes to life! 9" H x 9" dia. Care instructions: Moss terrariums need to be kept out of direct sun. Mist every 2-4 weeks. Please note moss and stones may vary. A great gift for anyone. These ladies create some beautiful pieces. These terrariums look great anywhere. In the home, in the office. A great gift to give no matter the gardening experience of the recipient. I personally have 4 of their pieces and have given some as gifts to a variety of friends and family. You won't be disappointed. Purchased as an Annversary and Valentine's gift for husband. He was very pleased receiving this as a gift. A true Uncharted Territory Terrarium. I purchased this terrarium and a few others to display in my office reception area. Quite a few clients have commented about how quaint and different the terrarium is. Like its own little world you wish you could shrink down to and explore yourself. I personally love how magical it feels. And it doesn't get easier when it comes to caring for the terrariums. I plan on buying more as gifts. Good stuff! it's a great customizable gift that lasts a long time, and relatively hassle free to upkeep. Warning if gift - May arrive broken! I couldn't resist buying this for our mountain cabin though it was expensive. I considered it as a mother's day gift to myself. It arrived to the cabin days before I did and I was concerned before I began unpacking it. It was masterfully packed in bubble wrap inside and out with a damp paper towel next to the moss. The people, though very small, are perfectly proportioned for the bowl and rock. The people have pins that anchor them in the moss which came off and I had to reglue. I sat it up on a candleholder type base to give it extra height and have enjoyed watching the different types of moss spring back up after their long trip to their new life with me! This adventurous terrarium is handmade by miniature world virtuosos Michelle Inciarrano and Katy Maslow.